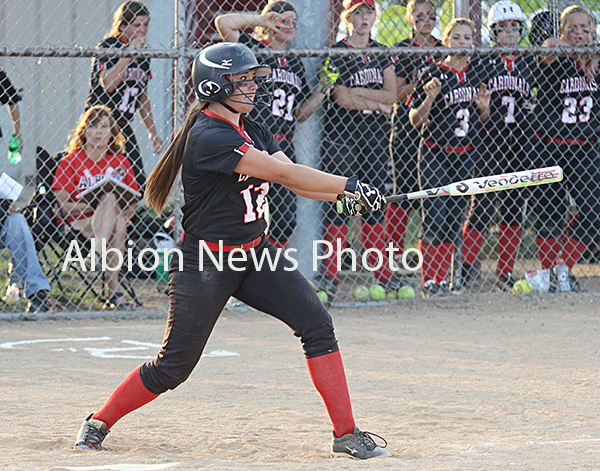 The Boone Central/Newman Grove Cardinals battered softballs and three opponents in winning the Boone Central Invitational championship Saturday at the Albion Sports Complex. Boone Central/Newman Grove feasted at the plate throughout the tournament, scoring at least nine runs in each of its three contests. With the victories, the Cardinals improved to 7-4 in 2016. “The girls are having a blast, loving the game of softball, and you can see them gaining confidence with every win,” said BC/NG Coach Danielle Amen. Boone Central/Newman Grove began its title surge with a 9-4 victory over the Polk County Slammers, sparked by an eight-run second-inning explosion. Boone Central/Newman Grove trailed Madison/Humphrey/Lindsay Holy Family 3-0 going into the bottom of the second inning in its next game, then unleashed its offensive fury on the visitors to notch a 15-4 four-inning victory. Boone Central/Newman Grove and Pierce fought a seesaw battle for the Invite championship, with the Cardinals scoring last in an 11-9 victory.